I have long been a fan of Diana Gabaldon’s Outlander books, and this latest in the 8-part and counting series did not disappoint. 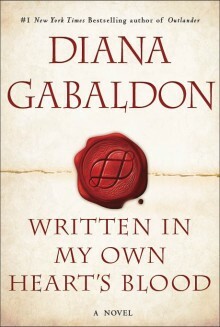 This book continues the epic tale of Claire and Jamie Fraser begun in the first book, Outlander, as well as dozens of added characters picked up along the way like Brianna, Roger, Lord John, William, Jenny, Ian, Rachel, Buck, Fergus, and Marsali, to name a few. Fans of the series will recognize the usual feast of relational tension, medical drama, mystery, action, and intelligent fantasy that has characterized Diana’s books. Gabaldon gives readers some excellent plot twists in this book, too. I don’t want to spoil it, so all I’ll say is the main twist is fantastic! I didn’t see it coming at all and it really satisfied. Like all of her books, My Own Heart’s Blood is a meaty, sink-your-teeth-into kind of book that will get under your skin and stay in your head for a long time after. And, like the other seven, I plan on reading this one over again. There will be more books in the Outlander series, but during the long wait for the next instalment, we can always console ourselves with the perfect new TV adaptation of Outlander. And apologies if my review gets you hooked. Consider yourself fairly warned.